Quick: What is the story of David and Goliath about? 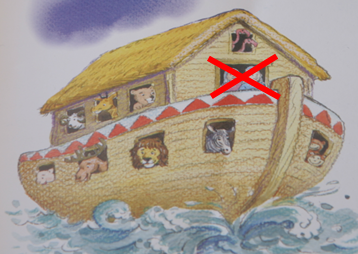 How about Noah’s Ark? Queen Esther? Moses and Pharaoh? If you answered that these stories illustrate something akin to: courage and trust in God; obedience to God; courage to stand up in a difficult circumstance; and/or leadership, then you may just be making the same mistake as us. Oops. It’s easy to do. In fact, children’s Bibles often encourage it. We emphasize the individual person (‘me’) over God. David challenges us to be brave and trust in God. But Goliath wasn’t defeated just because David trusted God. David’s story is really about illustrating how God defeats His enemies – any enemy, not matter how tall. Noah trusted in God and obeyed Him at His word. He built an ark and was saved from the flood. But isn’t this really a story that illustrates God’s judgement of sin and wickedness? The story of Noah gives us a graphic illustration of just how much God hates sin, and what kind of punishment sin deserves. Queen Esther could be about bravery and rising to the occasion, but isn’t it really about a covenant keeping God who delivered His people from annihilation? Mordecai himself even states this when speaking to Esther: “… for if you remain silent at this time, relief and deliverance for the Jews will arise from another place, …” (Esther 4:14). When we teach Bible stories in a way that centres on the merits and qualities of the characters, we miss the meta-story that the Bible portrays: sin is real, the consequence of sin is death, we need a saviour to take away that consequence, Jesus is that saviour, the only way to regain a relationship with God is through Jesus. Otherwise, our children end up with a tapestry of stories with moral lessons and miss out on the overarching gospel that is woven through the entire Bible. The Bible becomes fragmented. It becomes person-centred instead of God-centred. When I discovered this at a Children Desiring God conference, it radically changed how we presented Biblical text to our kids. Now, we look for what the story tells us about God first. It’s not that the characters in the stories and accounts are meaningless. Its not that they can’t teach us something. But they’re not the main thing. When we teach the Bible, we need to keep the main thing the main thing. This made a huge impression on me at the Children Desiring God conference too. You did a great job of summarizing this concept! It is amazing what a huge difference this shift/correction in perspective makes to the big picture of what our kids are learning from scripture! Thank you for sharing. It is very encouraging to hear that others are getting this message. I just ran across your blog today and what a great job you are doing. Thanks for the encouragement and all you do! Today’s “Our Daily Bread” entry reminded me of this post. I had to come back and reread it. Applicable for grown ups and kids alike!